It lights up with no wires! I was watching some of Big Clive's videos about LED lighting circuits recently, and was impressed by the simplicity of his emergency backup light project. I was also interested in the idea behind the "plug in" emergency lights, that can be controlled with a wall switch, regardless of whether the mains power is present or not. And finally, Clive's reviews of the LED filament bulbs show the degree of miniaturisation of the driver circuits that is possible. To leave room in the cap of the lamp for a battery, it was clear that a capacitive dropper style mains power supply would be necessary, as the alternative switchmode type would be appreciably bulkier. This provided something of a dilemma regarding the LED operating voltage. A lithium battery is essentially a low-voltage, relatively high current device - best suited to driving a parallel array of LEDs. But a capacitive dropper also gets quite bulky if required to supply a high current - they are better matched to higher voltage, higher impedance loads. Some commercial LED backup lights get around this limitation by having two sets of LEDs - a high-voltage series string to operate from mains power, and a low-voltage, high current set that are powered from the lithium cell. 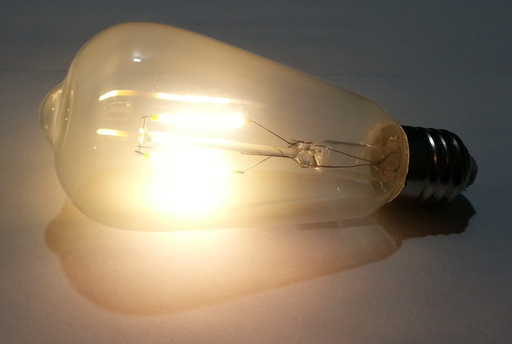 While it is possible to get the LED filament modules in both configurations, having two sets of filaments, only one of which was illuminated at once, would give the game away as far as the trick aspect of the lamp. Furthermore, the two types of filament would probably not look alike, even when powered off. 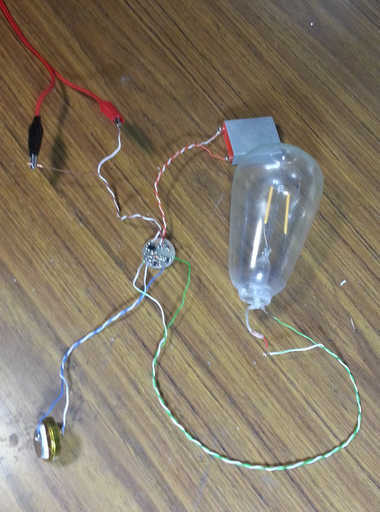 One way around this would be to have a boost converter (aka Joule Thief) to run a high-voltage filament from a battery. I did look at this option, but decided that it would add too much complexity for my initial experiments. Therefore, I decided to concentrate on the "non-maintained" mode of operation, in which the lamp is always off whenever mains power is present. I took Clive's circuit, and made a few changes to it. The bipolar switching transistor was replaced by a MOSFET. As this requires essentially no current to switch, the gate drive resistance can be made much higher. As with Clive's original circuit, when the mains power is on, current flow in D1 provides a reverse bias on the gate and prevents the LED from switching on. When the lamp is switched off at the wall, R3 pulls down the gate and keeps the LED off, while C1 bypasses any mains hum picked up by the wiring. The value of this capacitor is important - too low a value will not bypass noise effectively, and the lamp will flicker, while too high a value causes a visible switching delay. Circuit diagram of light bulb. Make sure you understand the safety information before construction. R1 and R6 have been placed across two of the arms of the bridge rectifier. Although these may appear to defeat the operation of the rectifier, they do not see much voltage swing, as the bulk of the mains voltage is dropped across C2, and merely cause a slight leakage current on one polarity of the AC cycle. When the power is off, and the circuit across the lamp terminals is bridged (potentially by quite a high impedance), current flows from the battery, through R6, the external circuit, R7, R8, R1, and R4, turning on Q1 and the LED. Note that these resistances form a voltage divider with R3. The given values were chosen to ensure adequate gate voltage for the MOSFET in view of this. If R5 is fitted, no external circuit is required, and the LED lights as soon as the power is removed. (This component could also be fitted across the main lamp terminals). 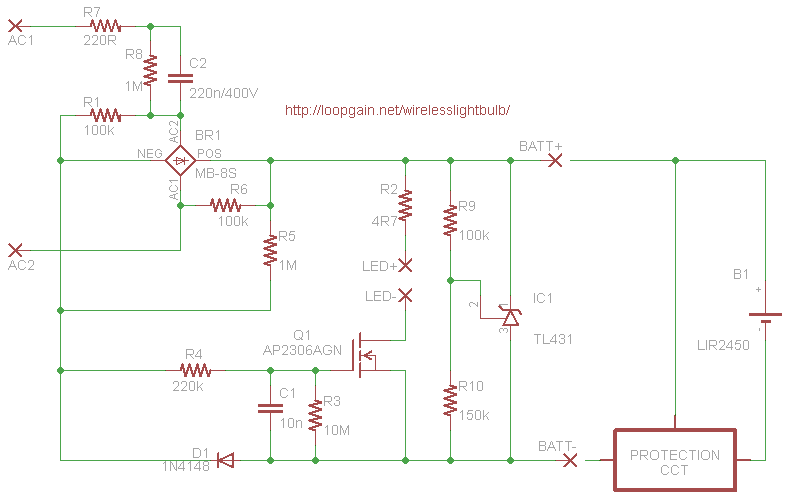 A TL431 shunt regulator provides regulation of the charge voltage of the lithium cell. This allows more accurate setting of the voltage limit than the zener diode used in the original circuit, and has a much sharper "knee". Relatively high values of the feedback resistors (and R3) limit the battery drain once the voltage drops below the forward voltage of the LED. A standard lithium-ion protection circuit gives further protection against overcharge and discharge. R7 limits the current resulting from high-frequency transients, and will act as a crude fuse in the event of a failure of C2. I built this circuit up on a breadboard, and found it worked well. (To avoid mains voltages on the breadboard, it was initially tested using a supply of 20VAC, with the value of C2 increased to compensate.) The next challenge was to miniaturise it, so that it could fit into a lamp base. The component choice for C2 was one important constraint on the overall size. A value of around 220nF was considered desirable, to give a charge current of around 15mA. Ideally, a class X2 film capacitor would be used in this position, however such a device would be too physically bulky for this application. Even the ordinary film capacitors, as used in many of the Chinese LED lamps, would be a bit on the large size. The only option was to use a ceramic capacitor. 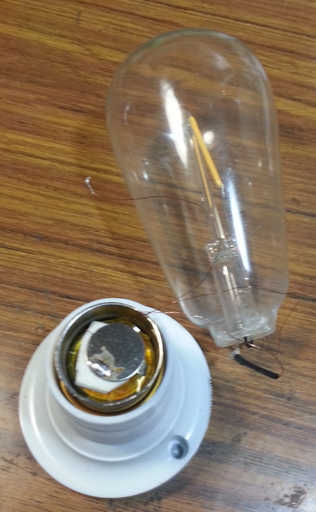 These devices are not really intended to live straight across the mains supply, however I have seen some LED lamps, of the bi-pin type intended to replace halogen capsule bulbs, use ceramic caps in this position. So, I figured this was probably acceptable for a one-off. After some searching, I located some 220nF 400V caps in a 1210 package. With the circuit design proven, it was then possible to move on to designing a PCB, and considering the physical layout of the circuit. I decided to use an ES lamp cap, even though the bayonet type are somewhat more common here in Australia, as the screw caps are slightly larger in diameter, and would give slightly more room for the components. At first glance, it may appear that the insulation requirements of a 240V circuit present an insurmountable obstacle to miniaturisation, particularly as the metal cap that surrounds the parts forms one of the contacts. However, although careful construction is still necessary, this is not the case. If the AC terminal adjacent to R6 is connected to the cap, most of the circuitry will only experience a relatively low potential relative to the cap. The only places where significant insulation would be necessary would be between the end contact of the cap and the rest of the circuitry; across R8 and C2; and across R7 (in the event that it fails open circuit). 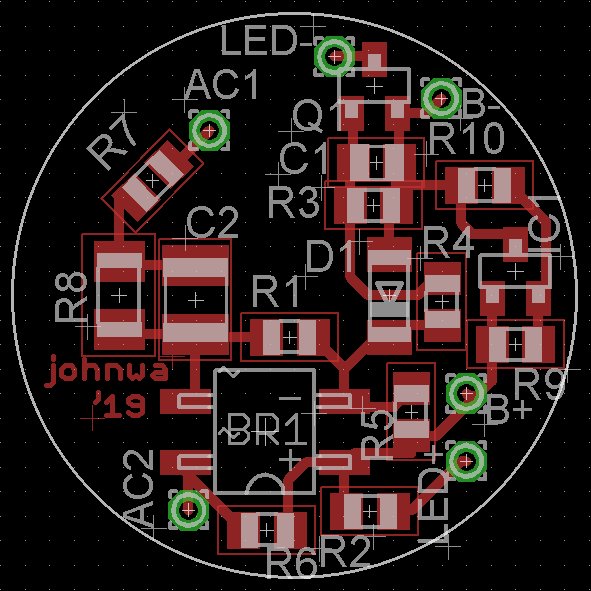 I started working with the concept of a round single-sided PCB in the base of the cap, with the copper side facing out, and with surface mount components loaded on this side. The full unbroken thickness of the board would insulate the end contact from the rest of the components. A single through hole would be placed near the centre of the board, feeding the AC input directly through to R7, R8, and C2. These components would be spaced away from other components, and the edge of the board, and would be insulated from the battery (installed above the PCB) by potting them in epoxy. I went on to design and fabricate a PCB based on this concept. The diameter of the PCB was set at 23mm, to provide adequate clearance in the cap, which measured around 24mm on the inside at the root of the threads. It was actually quite easy to fit all the components onto this board, and allow a few mm of clearance around the high voltage nodes. R7 and R8 were made 1206 packages, to provide an increased voltage rating, and better physical separation of the contacts. The other critical component as far as the physical size is concerned is the lithium-ion cell itself. I initially ordered a 130mAh pouch-style cell, but was unsure whether it would actually fit in the cap - the dimensions on the listing page were rather vague. I also ordered a lithium-ion protection board and some 3V LED filaments at the same time. While waiting for my orders to arrive, I spotted a "filament style" solar LED garden light in the Reject Shop - a local supplier of inexpensive imported goods. The bulb was of identical construction to a standard LED filament lamp, in the "antique" conical style, however the cap was moulded plastic, with the solar panel at the top, so it would not quite pass for an ordinary lamp as supplied. These were priced at $5 each - still quite reasonable - but one with a failed weld on one of the filaments caught my eye. This is normally a fairly terminal complaint, and I managed to get this one knocked down to a dollar. When I got it home, I removed the base, cut the glass off below the base using a heated nichrome wire, removed the filament assembly, resoldered it, and glued the bulb back together with superglue. The join was invisible once a cap was reinstalled, and the lamp was for the first time functional. However, it was pretty dim, due no doubt to the LEDs being supplied from a single 40mAh NiMH cell through a boost converter. Applying an external supply confirmed that the filaments were in fact capable of much greater performance, and that they were wired as parallel arrays. Looking around for other battery options, I found some rechargeable lithium coin cells, with a diameter of 24mm, a thickness of 5mm, and a capacity of 150mAh (designation LIR2450). These were a possibility, but would likely be a tight fit in the cap, as the internal diameter of a sample cap measured at 24.0mm. The only other possibility was a 20mm diameter coin cell, which had substantially less capacity. Again, all I could do was order some of each, and see if they would fit. When the cells arrived, my fears were confirmed - the larger one would not fit in the cap, measuring about 24.5mm, even after the insulation was removed. I did not want to force it it, as it would be virtually impossible to remove it again afterwards. However, I was determined to use the larger capacity cell if at all possible. As a first step, I measured the caps of all the ES based lamps that I had, trying to find one that was slightly larger than the rest. I though I might have found one that was suitable, but unfortunately the cap was just out of round, and the average size was much the same as the others. I then noticed that the threads were quite loose in the ES lampholders I had at hand, and wondered if it would be possible to enlarge one somewhat. I turned up a plug out of aluminium with a diameter of 24.6mm, and a slight taper at one end. 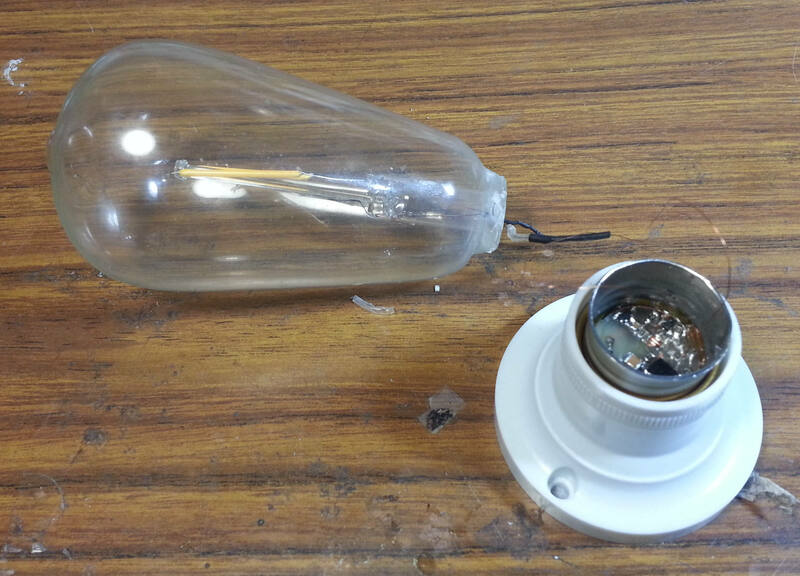 An ES cap was secured in a lampholder, and I attempted to tap the oiled plug into the cap with a mallet. However, this approach was a failure, as the thin metal of the cap distorted under the force. Still not deterred, I made up a roller burnishing tool by screwing a bearing to the end of a steel bar. This was secured in the toolpost of the lathe, and a new ES cap placed in a lampholder, which was then placed in the chuck. 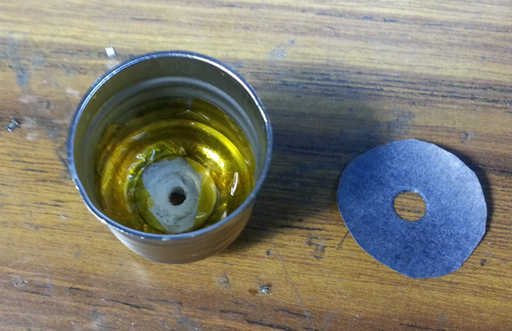 The lampholder did not provide a very rigid support at all, but I was able to carefully enlarge the cap by making a number of shallow passes back and forth with the burnishing tool. At last, I was successful, with the coin cell fitting inside the cap, even with some Kapton insulating tape around its edge. Although the cap was stretched slightly, it would still fit acceptably in most lampholders. 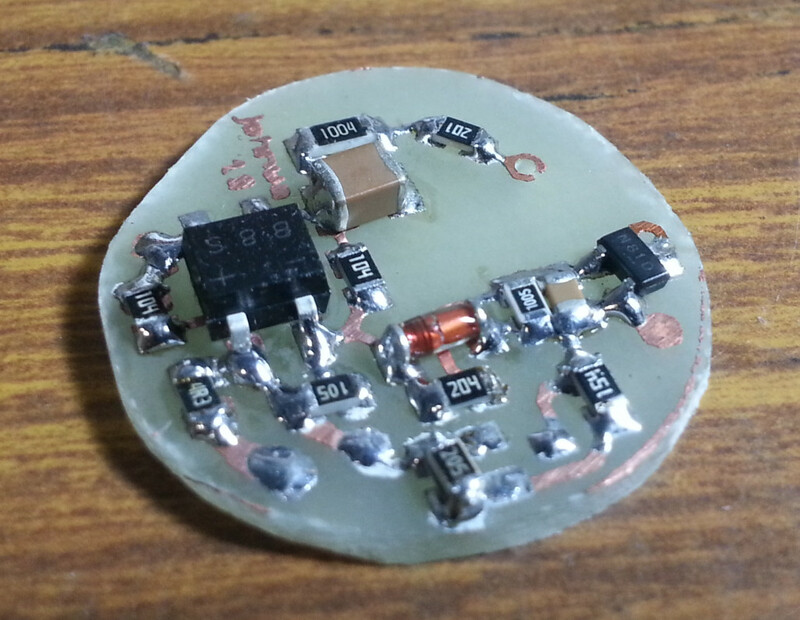 The lithium-ion protection PCB was then soldered to the tag on the cell. Unfortunately, the 18650-style board did take up a bit of room vertically in the cap - one of the tiny pouch cell protection boards might have been a better choice. Bearing in mind the consequences of a short circuit, and the possible forces resulting from the cramped assembly, the cell was then carefully insulated with multiple layers of Kapton tape. Testing the circuit. Note the large 4.7uF film capacitor for testing at reduced voltage. The main PCB, cell, protection PCB, and LEDs were then wired together and tested - initially at low voltage, then at 240V. This is an essential step, as it would not be possible to disassemble it easily if it did not work. After successful testing, the components were assembled into the cap. First, the wires for the off-board connections were replaced with fine enamelled copper wire, to enable them to be run between the cap and the battery. The bottom of the cap was lined with Kapton tape. A piece of wire was then attached to the centre contact of the PCB. This was passed though a disc of Elephantide insulating paper with a hole cut in the middle. The assembly was lowered into the cap, and the stud inserted into the end contact. The PCB was secured using blobs of epoxy at its edges, and more epoxy was used to pot over the high voltage connections. One option would be to install the bulb in a lamp that someone is responsible for turning off, then turn it on shortly before they are due to leave the area. This would work best with switched socket outlets (as used in Australia, the UK, etc), and with the socket not directly visible to the "victim". Leave the lamp plugged in, with the wall switch off. The switch on the lamp (or an inline switch) can be left in either position. The victim, on noticing the light being left on, will first try to extinguish it using the switch fitted to the lamp. This being unsuccessful, they will probably conclude that the switch contacts have welded closed (if they are a technical person), and trace the cable back to the wall socket. They will then notice that the switch here is in the off position. A second welded switch would be a remarkable coincidence, but they may try flipping the wall switch back and forth anyway. Depending on which state the switch on the lamp was left in, either the lamp will turn off when the wall switch is turned on (resulting in additional confusion! ), or will stay lit. Both possibilities will probably result in the lamp being unplugged , but the bulb will of course remain lit. The victim will probably start to get suspicious at this point. If the lamp looks like it is capable of concealing a battery anywhere, it will probably be examined, and hopefully the bulb will also be removed for inspection. And it will steadfastly keep glowing! There is of course a risk that the victim will hurl the bulb at the floor and smash it at this point. But another attribute of LED bulbs is that they do not rely on excluding air from the envelope, so barring any major mechanical damage, it will still remain illuminated. Another trick that can be played is to set up a lamp in a situation where someone is likely to need a torch or portable light source. Leave power applied to the bulb, so that it is not illuminated. Then, if someone asks for a torch, turn on the lamp, and ask "will this do?". If they object on the grounds of needing something portable, you can then unscrew the bulb (which will remain illuminated) and hand it to them. Alternatively, you can unplug the entire lamp and give it to the victim. Of course, the light bulb can also be used as a simple emergency backup lamp. Just install it into a suitable fitting, and leave power applied. It will automatically illuminate if the power fails. Note that if you do decide to build up one of these lamps, be aware that the circuit uses lethal voltage levels, and is not suitable for beginners. You should have considerable experience working with mains powered circuits before attempting to build it. Take care to ensure that the insulation is adequate, and mechanically robust, where required. Also ensure that the bulb is firmly secured in the base, so that it cannot come loose and expose live connections. I would also suggest using a more robust component for the dropper capacitor if the bulb is to be powered continuously. If you test the bulb before it is fully assembled, only insert or remove the base into a lamp while the lamp's power plug is removed from the wall socket - hold the plug in your hand to enforce this. Then, whenever the plug in inserted, stand back and maintain a generous clearance between all conductive objects and body parts, and the lamp. Use of an isolation transformer is also recommended - although you should still treat the circuit as if it were not isolated from the mains. 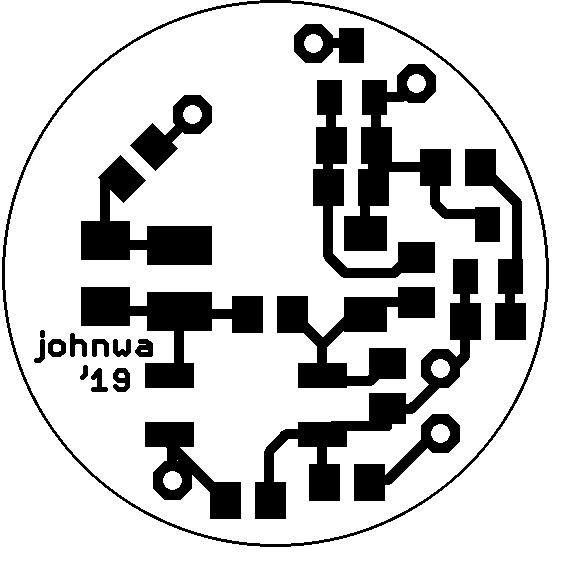 So, I hope that you have some fun with this design! Let me know if you manage to trick anyone with it!